When you’re feeling the strain of the work/life juggle and need to make a change, it’s time to enlist a team of supporters. Just as you would need sounding boards, mentors, friends or advisors to help you meet a career goal or strategize a project, a variety of supporters can help you find the work/life fit that is best for you. Some people may be helpful as you’re trying to figure out what isn’t working and what you’d like to change. Others may have great ideas about specific actions or tips to try — they might even be able to take some tasks off your plate. One supporter may be the person you need to hold you accountable — when some tough talk or clear thinking may be just what you need. Another may offer emotional support — someone who will listen, commiserate or just give you a break. Your work/life support team will also be invaluable if you have a crisis at work or home. You probably have a few people you consider your supporters, but take some time to consider the different roles people might play. Is there a type of support you could use, but don’t have? Or a person who could help, but you haven’t asked? Emotional Support. Who can encourage you? Who can listen and help you push through a tough spot or a setback and share your enthusiasm when you’ve made progress or tried something new. A friend in a similar situation, a family member or peers at work may play this role. Cognitive Support. 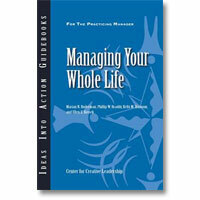 Who can help you learn about and re-think ways to manage boundaries between work and family? A coach or mentor could provide you with guidance or resources and help you figure out new ways to approach your particular challenges and needs. You can also find cognitive support through online communities, podcasts and apps. The key here is that you need other perspectives and information to break out of your routine or mindset. Political Support. Who knows your work and career realities and can help you see options for managing your job? A mentor, your boss or peers could help you gain access to resources or opportunities that would meet your goals for a better work/life fit. Self-Support. How can you give yourself better care and support? Exercise, diet and sleep all help you minimize stress and boost resiliency. Meditation and yoga are also helpful self-support options. If you aren’t sure what work/life changes you want to make, spend some time thinking about yourself. Get some clarity about what is and is not working for you and what you’d like to change. On your own — or with a trusted friend, family member, or group — consider your own preferences and current situation. How do you currently manage the boundaries between your work and personal life? What could you change? For more ideas, read 5 Steps for Getting Your Work/Life Act Together. Or take a closer look at your behaviors, identity and perceived control — three factors that research shows are tied to finding the work/life fit that is right for you — with the CCL self-assessment, WorkLife Indicator.